Blueberries are plump and sweet right now and it’s hard not to buy them by the caseload. 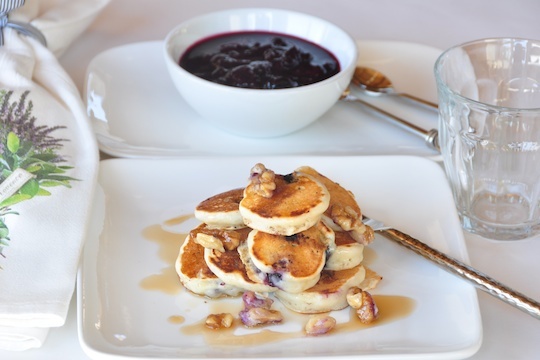 Some of them made it into a few jars of jam, some into simple desserts (Blueberry Buckle, to be posted) and a few get incorporated into breakfast foods, whether on top of cereal or, as in this recipe, inside and on top of pancakes. I make these lovely breakfast treats in regular size or in mini form. For the mini ones I use a small ice cream scoop, for the larger ones, a larger ice cream scoop. This recipe makes about 8 large or a bunch of small pancakes. Pancakes are not an everyday breakfast here. If you read my blog you may have noticed that I go a long way to get oatmeal (or is porridge the correct term?) for breakfast (see my excursion to Seattle here). But on weekend I do like serving pancakes, waffles or other special breakfast foods. We have made quite a ritual of breakfast whether at home or while travelling and you can check out the series of articles on Luxury Breakfast on the Mayan Riviera that I have posted under the Travel section (see Resources in the left column) as well as published on Trip Advisor (here). These articles generate a large readership so they must have hit a cord with many. Oscar Wilde said that only dull people are brilliant at breakfast. He is hilarious. Brilliant or dull, breakfast is my “thing” and I have prepared a 400 page breakfast book as a gift to my children, full of my breakfast creations. Here is one of them. Combine self rising flour, baking soda and sugar in a bowl and stir. Place egg, buttermilk and oil in an other bowl and whisk to blend, breaking up the egg so it is mixed with the liquids, then add to flour mixture. Toss blueberries with the flour and stir gently into the batter. Batter should remain lumpy, be careful not to over mix it. Scoop batter with an ice cream scoop (regular or mini) onto a lightly oiled griddle until golden and puffy, turning over once. Combine walnuts with maple syrup. 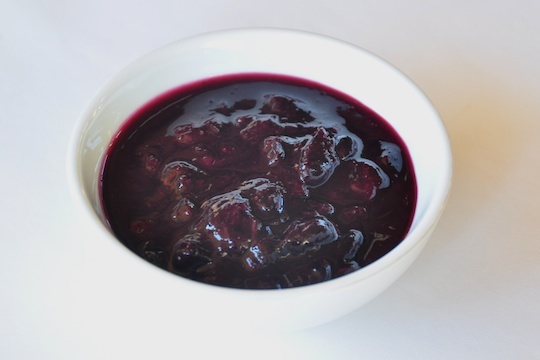 Cook blueberries, orange juice and sugar in a small pot over medium heat until the blueberries soften and mixture is syrupy. 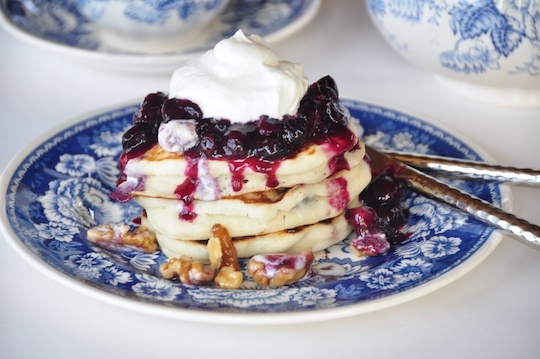 Serve pancakes with warm blueberry syrup, maple walnuts and whipped cream. Oh yes. I love blueberry pancakes but I always maked them the original size (3 inches in dimeter). It is actually agood idea to do it smal so you can enjoy other food at braekfast time. I love the silver dollar sized pancakes. There is a place called Sears across from the conference hotel in San Francisco that I have always wanted to try that makes them this way…although there is always my kitchen at home. Hi Val, thanks, they are fun in mini size. You can eat them with just a fork. Will make a note of the San Francisco place to try. I will be there in November. Hope to see you soon.